If you have ever felt that you’re being forced out of the property game – you’re not alone. In fact, the Australian Prudential Regulation Authority (APRA) have just passed some changes that will force many investors to seek a new career. And other parameters are being applied to reduce the bank’s exposure even further, with more to come moving forward. There’s A Big Opportunity For You! Any investor who’s still relying on the bank to fund their purchases is in for a nasty surprise next time they apply for a loan. But it also means that savvy investors, like those reading this blog post, stand to win… and win big. You see, I’ve been doing some research into the property market since I returned to Australia from my two years in France. What I uncovered stunned me. I have found piles, over piles, over piles of lazy money that’s waiting to be scooped up. Money that can literally fund ANY deal you can dream up, without ever going to the bank. There’s way more money than I’ll ever need for my property career, so I’ve decided to show you where you too can find this lazy money. It’s not hard once you’re tuned in to it. And right now there’s so much opportunity… so much money out there… and so few people are taking advantage of it. So starting today, and over the next three blog posts, I’m going to teach you how to find this available money, scoop it up, and use it to fund your own deals. In the current marketplace, I’ve also been hearing that some property investors are having trouble finding deals that stack up, funding their deals and managing them to a profitable outcome. Achieving these objectives can be difficult to do without the right skill set. Having the skill to take the deal to a profitable outcome in a specified time frame. Most people have only one or two of these components. In fact, when I first started in property investing, I had none of them. I was just a postie trying to figure out how to make it all work with limited resources. I can vividly remember one of the first phone calls I made to one of my colleagues asking him to fund one of my deals. I was so worried that he would say “no” and I wouldn’t be able to settle on that deal. But I was even more afraid that he would say “yes” and that I would mess up the deal so badly that he wouldn’t get his money back. It was scary, but I worked through it. Really, I’m just like you. And I’ve proven through my own history that it is possible to become a successful property investor and live the life you want—even when you are starting with nothing. I’m a postie who turned his life around. I’m now doing property investing full time. I used to be delivering mail for a living and earning $30,000 per year. Now, I’ve done more than $5 million in property deals for myself. I’ve also worked with all sorts of people on a stack of joint venture deals that have been worth 10 times that amount. What I want to share with you is how I busted through some of my fears in the early days and became one of the industry’s “go-to” guys for putting property deals together. I’ve been facilitating my popular property networking groups for 10 years, so I’ve had the opportunity to talk to all sorts of people, from new property investors to part-time investors with full-time jobs to professional property developers. Most people want to have the choice to do what they want to do in their lives. Some people are OK to coast comfortably through life. But there are others—like you and me—who want to do more. It’s OK to want more, but you have to restructure your life to allow you to have more choice. You can choose to be in the 9-to-5 grind all your life, or you can choose to do something else that allows you to dictate your own terms and when you take holidays. You can choose to buy a lotto ticket and hope you win, or you can choose to learn new strategies about how to create more income. You can choose to have a 40, 60, 80, or 100-hour work week, or you can choose to work smarter and buy your time back—which is what I’ve been able to do. Choice allows you to restructure your life, live it on your terms and not be dictated to. And because it’s just a decision, you can make those choices in an instant. So how did I get where I am today? I didn’t inherit a whole stack of money. I didn’t grow up around property investors. I bought my first property investing book when I was 33 years old after I decided that I wasn’t going to swap my time for money anymore. I can remember the exact point in my life when I made that decision. I was looking at my pay packet and trying to figure out how much annual leave I’d accrued. I figured out that I had to work 40 hours to get three hours off. After those numbers sunk in, I made the decision to change how I lived my life. I still use that 40/3 formula today to motivate me to keep moving forward so I never have to look at my time this way again. That was the start of my journey—and it got more challenging from there. I had to learn how to be a property investor by doing renovations, painting walls until all hours of the night, installing toilets and ringing friends and family to help me lay turf and sand decks to save money on trades. It nearly killed me at the time. But what happened next was that I got wise. I started using more profitable strategies such as subdivision, development and joint venturing—and eventually went on to do better deals. Along the way, I made lots of mistakes and did lots of things wrong. I did some good deals—and some not-so-good deals. And those mistakes are what brought me to where I am today. These days, I get to live life on my own terms. I get to spend time with my family, travel overseas and see the world through my kids’ eyes. If you would have seen me 10 years ago riding around on my postie bike and said “Matt, in 10 years, you are going to be living in France on the spoils of your property investing business,” I would have thought you were nuts. When I looked back on what I’ve done, I realized it’s not rocket science. Anyone can do it if they follow a proven formula. 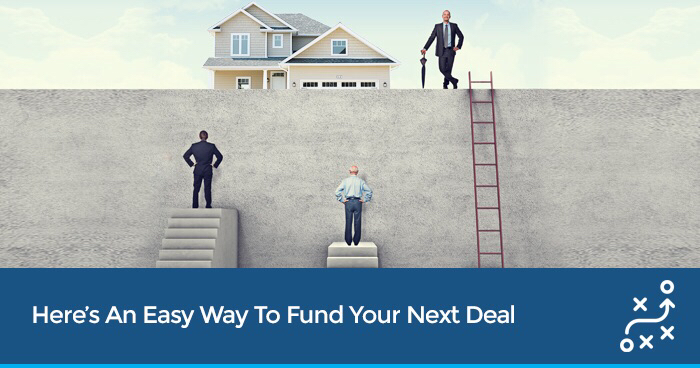 And one part of this formula involves tapping into the enormous amount of cash in the property market by engaging joint venture partners to provide the funding you need. But, you need to have the mindset that there is plenty of money available to use. If you’re the shy type, don’t worry… I’ll show you how to overcome this as we move along. Attending property networking group meetings puts you in contact with other like-minded investors who have similar concerns and challenges. These groups also create a great environment to connect with others who are looking to do a joint venture. For example, I met a lovely couple at a networking group meeting who went on to become long-term finance partners on several of my projects. Networking groups can be intimidating if you are shy or introverted, but there are several ways to overcome those fears so you can reap the benefits of these meetings. The right person will jump at the chance if you approach them in the right way ans may end up funding multiple deals. All it takes is a scroll through the contacts on your phone and a couple calls to see if anyone might be interested. I’ll show you how I make this work in the next video. Family and friends can be great joint venture partners; just be sure to tread carefully. No property deal is worth damaging a close relationship, so you should be sure to treat the joint venture like any other business transaction and avoid doing deals on a handshake. Like property networking group meetings, mentoring programs are perfect place to meet other like-minded property investors. Some of my best joint venture partners have come from sharing a room with fellow mentoring students. Eg. Borrow $100k @ 20% for six months costs $10k which could be the difference between deal and no deal. If it costs me an extra $10,000 to make $50,000-$200,000 in profit, I’d be happy to pay the extra money to get the deal over the line. Although these tips will put you on the path to accessing all this lazy money out there, I have a few more things to share that will help you get all the joint venture partners you want. In my next post, I’m going to share some case studies from my early days in property investing to show you how I amassed a small fortune in joint venture funding. And if you’re still feeling a little afraid or apprehensive about getting into a joint venture, I’ll provide you with some strategies to help with that, too. You should also download, print and review my Joint Venture Matrix—we’ll be using it in the next video to help you figure out where you are on your journey and how you can get to the next level. I have just tested out the link and it seems to be working fine for me – may I ask what browser you are using?